The seventh recorded perihelion passage of Halley's Comet occurred. Italian Jesuit Niccolo Zucchi saw two belts on Jupiter's surface, the first observations of cloud belts on Jupiter. The history of the New York Stock Exchange began when twenty-four brokers and merchants meeting under a buttonwood tree located at 68 Wall Street signed the Buttonwood Agreement. The International Telegraph Union (later renamed as the International Telecommunication Union) was established. J. Palisa discovered asteroid #266 Aline. Archaeologist Spyridon Stais found the Antikythera mechanism, an extremely complex and precise clock-like mechanism dating from ancient Greece, circa 89 BC. M. Wolf discovered asteroid #891 Gunhild. Died, Max Valier, in Berlin, when a steel-cased rocket motor, fueled by a kerosene/water mix and liquid oxygen, exploded while he was testing it. Valier conceived of a rocket powered space shuttle years before one was built. The original design and development of the US Aerobee sounding rocket began when a contract was given to Aerojet Engineering Corporation. The first atomic reactor patent was issued to Enrico Fermi and Leo Szilard, six months after Fermi's death. USSR undertook development of the PKA Spaceplane Draft Project. P V Tsybin's OKB-256 designed a gliding spacecraft (PKA) in response to the USAF Dynasoar project when Soviet aviation bureaus were tasked with producing draft project designs for a manned spaceplane. Tsybin signed the draft project on 17 May 1959, to be undertaken in cooperation with Korolev's OKB-1. A manned PKA would be launched to a 300 km orbit on a Vostok rocket. After spending 24 to 27 hours in space, the craft would brake from orbit using retrorockets, then glide to a runway landing. As it entered the atmosphere, the spacecraft would use an original hull shape in the zone of most intense heating called "Lapotok" by Korolev after the Russian wooden shoes that it resembled. After braking to 1800-2100 kph, the PKA would deploy its wings at an altitude of 20 km from their stowed vertical position at the back of the spacecraft to a horizontal position, and glide to its landing. Attitude and directional control of the PKA would be by rocket jets or aerodynamic surfaces, depending on the phase of flight. Eight H-1 engines of the first stage of the Saturn C-1 launch vehicle were static-fired for 35.16 seconds, producing 1.3 million pounds of thrust. This first public demonstration of the H-1 took place at the Marshall Space Flight Center. NASA launched the Gemini 9 Agena Target Vehicle A (vehicle GATV 5004) which suffered a control system failure and plunged into the Atlantic Ocean. The Gemini 9 Agena Target Vehicle A (vehicle GATV 5004) was intended as a docking target for the Gemini 9 mission, scheduled to launch 99 minutes after the GATV. 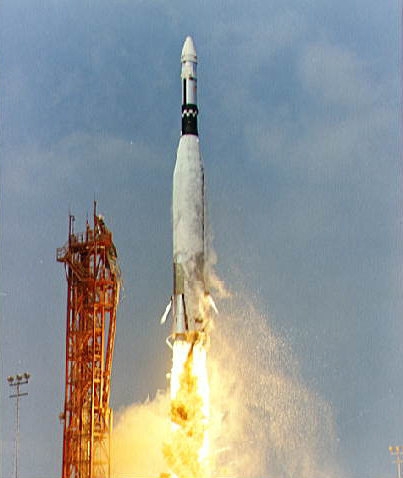 The GATV launch took place on 17 May 1966. At 120.6 seconds after liftoff, the Atlas number 2 booster engine swiveled to an extreme hardover position about 10 seconds before booster engine cutoff. The other booster and sustainer engine, under autopilot, worked to counter the asymmetrical thrust, but the vehicle pitched downward, and after booster separation, the vehicle continued flying under sustained thrust, having pitched down 216 degrees from the 67 degree nominal position, so it was flying north, back toward Cape Kennedy, at a climbing angle of 13 degrees above horizontal. It had also rolled to a position where ground guidance could not lock on. The vernier engines cut off at 300 seconds, the Agena separated on schedule, and both vehicles plunged into the sea about 172 km northeast of the launch site, 145 km off the coast of Florida, seven and a half minutes after launch. Radar data from the Grand Bahama Island station at 436 seconds after launch placed the vehicle about 191.6 km from the launch site at 29,500 meters altitude, headed north and descending. The exact reason for the loss of engine pitch control was unknown, data indicated that a short to ground occurred in the circuit for the servoamplifier output command signal. The short may have been caused by cryogenic leakage in the thrust section. The scheduled launch of the Gemini 9 spacecraft was cancelled. NASA launched X-15A Telemetry/HT/Guidance Test mission # 181 above Edwards Air Force Base, California, which reached a maximum speed of 5113 kph (Mach 4.80) and a maximum altitude of 21.671 km, but was a failure because of severe tail oscillations. The European Space Research Organization's first satellite, the ESRO 2 technology satellite, was launched from Vandenburg Air Force Base, California, into an orbit inclined 97.2 degrees with respect to the equator, with a period of 99.0 minutes. USSR's Venera 6 entered the Venusian atmosphere and returned data for 51 minutes. T. Smirnova discovered asteroids #2400 Derevskaya, #3082 Dzhalil and #3146. USSR launched the Cosmos 558 DS type military satellite into orbit from Plesetsk "for investigation of the upper atmosphere and outer space." NASA launched SMS 1, a weather satellite, into geosynchronous orbit. SMS 1 (Synchronous Meteorological Satellite A) was a NASA developed, NOAA operated spacecraft which was launched 17 May 1974. The spin-stabilized, Earth-synchronous spacecraft carried (1) a visible infrared spin-scan radiometer (VISSR) which provided high-quality day/night cloudcover data and made radiance temperatures of the Earth/atmosphere system, (2) a meteorological data collection and transmission system which relayed processed data from central weather facilities to small APT-equipped regional stations and collected and retransmitted data from remotely located Earth-based platforms, and (3) a space environmental monitor (SEM) which measured proton, electron, and solar X-ray fluxes and magnetic fields. The cylindrically shaped spacecraft measured 190.5 cm (75 inches) in diameter and 230 cm (90.5 inches) in length, exclusive of a magnetometer that extended an additional 83 cm (32.5 inches) beyond the cylinder shell. The primary structural members were a honeycombed equipment shelf and a thrust tube. The VISSR telescope was mounted on the equipment shelf and viewed the Earth through a special aperture in the side of the spacecraft. A support structure extended radially out from the thrust tube and was affixed to the solar panels, which formed the outer walls of the spacecraft and provided the primary source of electrical power. Located in the annulus-shaped space between the thrust tube and the solar panels were station-keeping and dynamics control equipment, batteries, and most of the SEM equipment. Proper spacecraft attitude and spin rate (approximately 100 rpm) were maintained by two separate sets of jet thrusters mounted around the spacecraft equator and activated by ground command. The spacecraft used both UHF and S-band frequencies in its telemetry and command subsystem. A low-power VHF transponder provided telemetry and command during launch and then served as a backup for the primary subsystem once the spacecraft had attained synchronous orbit. SMS 1 was positioned in geosynchronous orbit over the Atlantic Ocean at 45 deg W in 1974-1975; over the Atlantic Ocean at 75 deg W in 1975; over the Americas at 105 deg W in 1976-1978; over the Americas at 91 deg W in 1978; over the Atlantic Ocean 75 deg W in 1979; over the Atlantic Ocean 70 deg W in 1979; and over the Pacific Ocean 132 deg W in 1980. As of 3 September 2001, it was at 84.60 deg W drifting at 5.986 deg W per day. USSR launched Intercosmos 11 into orbit for investigation of solar ultraviolet rays and X-rays and the Earth's upper atmosphere. France launched a Diamant BP.4 from Kourou carrying a pair of 36 kg satellites called Castor and Pollux into orbit to test hydrazine catalytic decomposition micropropulsion units, and the CACTUS ultrasensitive triaxial capacitive accelerometric sensor. USSR launched Cosmos 1099, a military surveillance satellite, for "investigation of the natural resources of the earth in the interests of various branches of the national economy of the USSR and international cooperation." USSR launched Cosmos 1366, a military communications satellite, for "investigation of outer space and experiments in relaying telegraph and telephone information in the centimeter wavelength range." The US Space Command broke ground for the Consolidated Space Operations Center (CSOC) at the Falcon Air Force Station, Colorado. USSR launched Cosmos 1462, a maneuverable high resolution photo surveillance satellite equipped for film capsule return, which also performed Earth resources tasks. USSR launched Cosmos 1553 from the Plesetsk launch facility, a Tsikada military communications satellite which replaced Cosmos 1383. An Ariane booster, launched from Kourou, placed the Intelsat 5A F-13 commercial communications satellite into orbit, which was positioned in geosynchronous orbit at 53 deg W in 1988-1995 and 177 deg W in 1995-1999. Cosmonauts Dezhurov and Strekalov executed the 6h 42m Mir EO-18-2 EVA to begin reinstallation of a solar array aboard the Russian space station, assisted by astronaut Norman Thagard inside the station. An Ariane 44LP launched from Kourou placed the Intelsat 706 commercial communication satellite into orbit, which was positioned in geosynchronous orbit at 53 deg W in 1995-1999. A Delta rocket launched from Vandenburg Air Force Base, California, placed five Iridium satellites (#70, #'s 72-75) into orbit as components of the commercial communication satellite constellation. The CSXT GoFast test mission became the first civlian rocket, built by volunteers, to reach outer space. The CSXT GoFast test mission, launched 17 May 2004, was the first civlian rocket, built by volunteers, to reach outer space. It was launched from Black Rock Desert, Nevada (latitude: 41.00 N, longitude: 119.00 W). The payload was recovered the next day, and the data download showed the rocket had reached 72 miles (116 km) alitutde, and a maximum velocity of mach 5.5. Viktor Vasilyevich Gorbatko (3 December 1934 - 17 May 2017) was a Soviet cosmonaut who flew on the Soyuz 7, Soyuz 24, and Soyuz 37 missions. 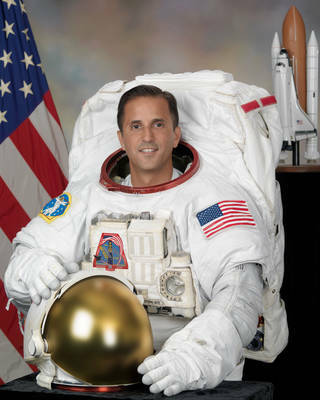 After leaving the space program in 1982, he taught at the Air Force Engineering Academy in Moscow.